Home Heartbeat's wireless base station sends security updates to the Home Key. Have you ever got half-way to work and wondered whether you've left a window open? Then perhaps Eaton's Home Heartbeat system, which uses wireless sensors to monitor a house, can help. The Home Heartbeat starter pack ($169.99) features a wireless base station, 'Home Key' and a simple Open/Closed sensor. 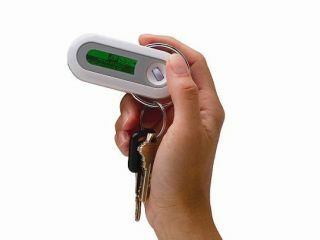 The base station is designed to communicate with the Home Key, which is essentially a key fob with a small LCD panel. The base station monitors any installed sensors around the home and sends status messages to the Home Key. As its name suggests, the Open/Closed sensor can detect whether you have left a door or window open. The Power sensor monitors the status of electronic devices, while the Motion sensor can alert you to movement in designated areas. Because the Home Key takes interrogates all installed sensors as you leave the home, you can view the status of doors, windows, TVs etc on the LCD. Did you leave the window open? If you've installed a sensor on it, then Home Heartbeat will be able to tell you. Extra water, power and motion sensors can be purchased separately for between $30 and $55. Eaton describes Home Heartbeat as the 'world's first home awareness system", but Motorola tried something similar last year with its Homesight system. Admittedly, Motorola's version used its own 802.11g network to communicate between devices, which was subject to interference. The two-way, low-frequency Zigbee standard is much better suited to this type of product.